Fujio (Tadanobu Asano) and Mitsuo (Show Aikawa) are two half-wits obsessed with Jujutsu who work in the shadow of an enormous man-made toxic garbage mountain dubbed the "Black Fuji". The undead eventually rise up from the ashen dirt and overtake Tokyo with the oblivious pair embarking on a journey to escape to Russia and survive by their limited sparring ability. Sakichi Sato's Tokyo Zombie is one of those rare instances in which a cinematic sitdown leaves you entirely cold, but strangely reluctant to lay the blame on the movie itself. After its early millennial renaissance, the Far East horror scene quickly dwindled by the time this particular film debuted in Japan. I can even recall first hearing about Tokyo Zombie and being surprised to hear of a new Japanese horror film aside from Kurosawa's ultimately so-so The Loft. Unsure what exactly caused this dim in popularity, but Japanese audiences aren't immune to burnout, as evident in the Sadako mania to sweep the country after the release of Hideo Nakata's Ringu. So by the mid-point of the last decade, J-horror was stumbling on its feet and I remain leery of this on-going wave of over-the-top gore. Interestingly, this faithful adaption of Yusaku Hanakuma's manga could be viewed as an open rejection of the staleness that became the country's genre endeavors by that point. The zombie aspect is pushed so far into the background that it proves an unsatisfying device employed for drama in what's essentially a standard buddy comedy. Instead, the focus rests on the progression of the almost father-and-son relationship between Fujio and Mitsuo. This will most likely alienate those coming for the undead. 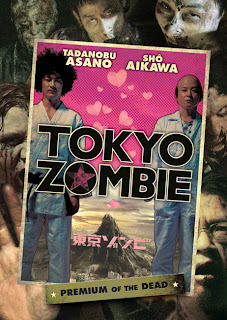 If the painfully quirky leads don't click, you'll probably not want to stick with Tokyo Zombie to its conclusion. The bulk of the comedy is no relief being a very Japanese style of subtle Laurel & Hardy slapstick. Unlike the superior Shaun of the Dead (2004) and Braindead (Dead Alive) (1992), the zombie wrapping paper isn't an integral component to the comedy. Sato offers a brand of quick-witted character interplay, presumably playing better to those fluent in the native language, than to those sifting for humor in subtitles. Again, this will most likely alienate those coming for the laughs being neither here-or-there as a comedy or horror film. 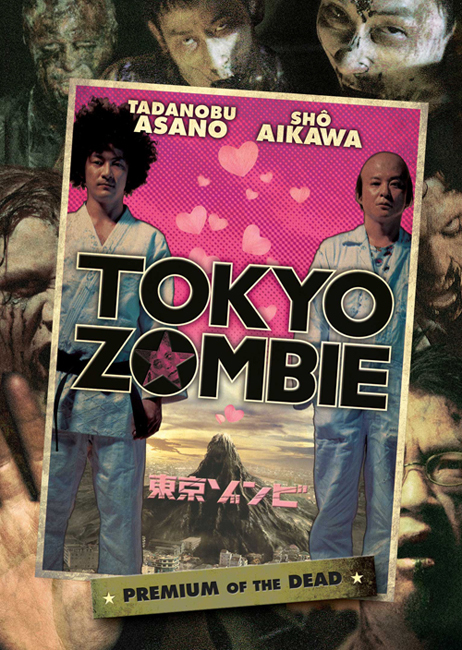 Tokyo Zombie is on an island by itself where both of its key elements cancel each other out. Maybe that's the point? A screen interpretation that probably plays best with those who are already fans of the manga. Sato, who played "Charlie Brown" in Kill Bill Vol. 1, should be praised for translating the source to film so well considering the budget. Asano and Aikawa hold their own as the eccentric duo anchoring the overly zany proceedings. The inclusion of the country's enduring subtext of mankind's doings and sloth being its own end, think Godzilla, is also a nice touch. Still, if you're looking for zombie mayhem, a laugh riot, or even really a combination--look elsewhere.